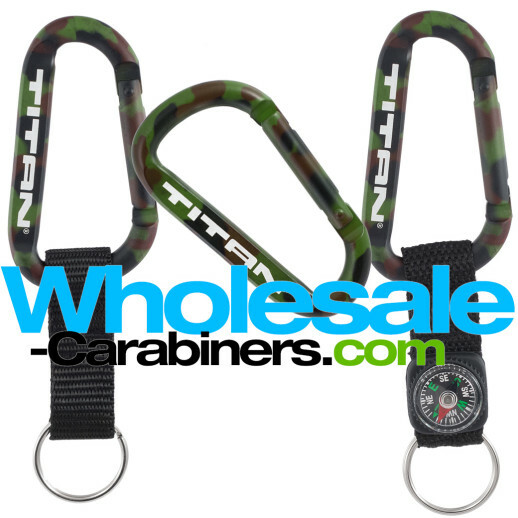 Camouflage Carabiner 3.125" 80mm from 77¢ at Wholesale-Carabiners.com! Ready in 3 days, we will custom engrave the camouflage carabiner with your logo or branding message. Add a strap or compass for greater versatility and even more rugged functionality. A rugged classic! The 3.125" camouflage carabiner arrives with a custom laser engraved imprint included in the low price and featuring a sleek, rugged anodized aluminum camouflage finish. A great gift for adventure lovers, military personnel, and outdoor enthusiasts. Want both sides engraved? Just add .25 per unit. Or add a key strap or compass to complete your order. Engraving area: 2" x .1875"